ABOVE: A view from room 708 of the Conrad Hotel de Ville. Durant Imboden spent a week at this comfortable, modern, and impeccably clean family-owned hotel for leisure and business travelers. It's only half a block from the main railroad station and within a few minutes' walk of the city's pedestrian zone. The staff are friendly, and the breakfast buffet has all the usual dishes plus Bavarian specialties such as Weisswurst, Bratwurst, and Leberkäse. Highly recommended. Pets are welcome at the Hotel Amba, which has 86 moking and non-smoking rooms in a modern building near the Hauptbanhnhof. The Hotel Astor is close to the Hauptbahnhof in the city center. Rooms have 1, 2, 3, or 4 beds, and parking is available. 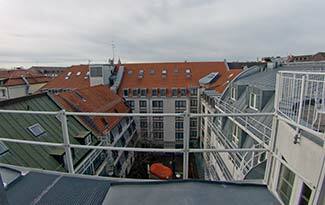 The 91-bed Superior Hotel Bristol is near the Sedlingertor, an easy walk from the train station or the Marienplatz. Most rooms have balconies, and you can eat breakfast on the terrace in summer. The Hotel Carmen is in the Sendling district, about 2 miles (3 km) south of the city center. Parking is available, and a U-Bahn stop is nearby. The Hauptbahnhof is close by, but this hotel's real attraction is the Bavarian-style decor. The Hahn has 40 single and double rooms. This local group has three properties: Seibel's Park-Hotel in Passing, the Hotel Seibel (near the Oktoberfest grounds), and the delightfully-situated Pension Seibel at the Viktualienmarkt. If you expect to go out drinkin' and come home stinkin' during Oktoberfest, the Kurpfalz is a convenient place to stay. It's next to the Wies'n and a 15-minute walk to the Hauptbahnhof.